California wines, Napa Valley warmth and seasonal, approachable American cuisine in the heart of Westwood. : Following a three-month, $2 million renovation, Napa Valley Grille reopened in March 2016 with a new private wine room, expanded bar and event space, plus a revamped lounge-style patio where guests can enjoy open-air dining or simply linger with a glass of wine. 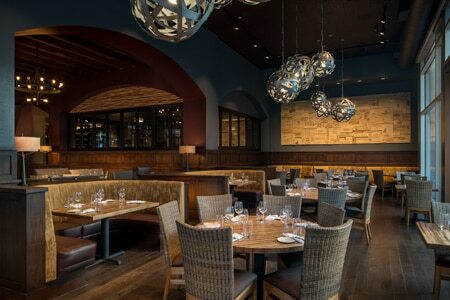 Reflecting the warmth of the Napa Valley wine region --- think earth tones and natural textures like stone, wood, tile and copper --- the restaurant offers a welcoming environment that pairs well with the menu of seasonal, approachable American cuisine. New executive chef Adrian Vela (formerly of sister location Café del Rey) is squarely focused on supporting local purveyors, farmers and responsible seafood providers --- the menu features 100% sustainable fish. Branzino with tarragon, pink peppercorn, maitake mushrooms and local citrus is a standout while other highlights include West Coast oysters, Wagyu meatballs and crispy pork Milanese. Chef Vela, whose father was a farmer, has an innate respect for farmer sustainability. "I could give you ahi tuna or Chilean sea bass, but I wouldn't be diligent about our commitment to sustainability and educating the public. If they ask why, then it's an opportunity to inform them." Drinks include wine-on-tap selections from the California-centric wine list, craft beer and more than 40 cocktails. Twice daily Happy Hour at the bar is a local draw; thankfully, there are now more seats to accommodate the crowds.